I am back in Australia after visiting with backstrap weaving friends in the USA. Why am I back here again? Well, I did something quite mad when I was last here in August…I went and booked a weft ikat workshop in Bali at the end of this month! As you know, I have been dabbling on and off in warp ikat with varying degrees of success these last few years. I used small strips of warp ikat in this piece to learn about the technique. Then I started to get more adventurous with these pre-columbian bird figures. After dyeing the warp black, I wove and filled in the white ikat shapes with pick-up patterns. Some more experiments with pretty pleasing results. I love it when my experiments can be turned into useful things. This is the draw-string bag for my Kindle. An attempt to create a circle in ikat and fill it with pick-up pattern. Due to take-up, my circle got flattened as I wove it! 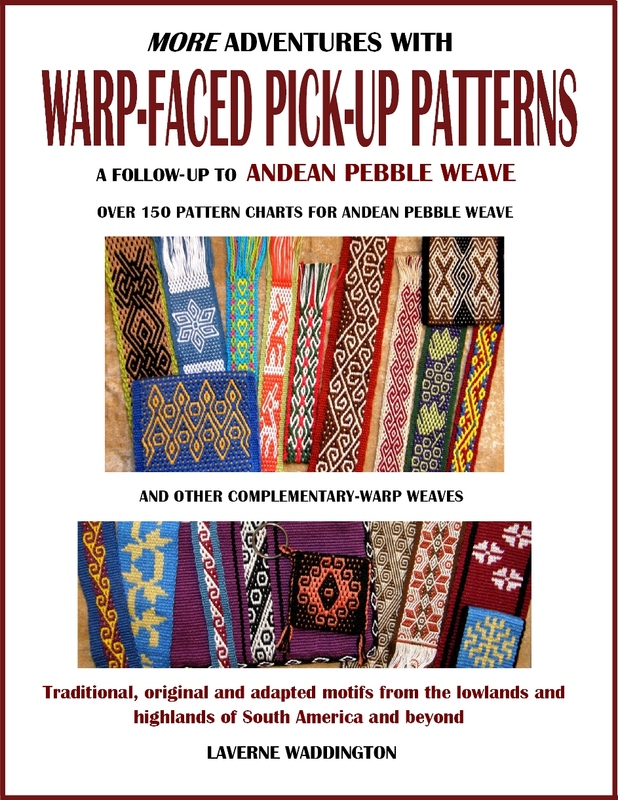 The workshop in Bali seems like the perfect chance to learn about weft ikat so that I can perhaps start putting warp and weft ikat together to create double ikat pieces. We will be using natural substances for the dyeing and combining two colors…exciting! I have done one experiment with ikat in two colors in which I over-dyed parts of the first dyeing in terracotta with dark blue. I didn’t end up with dark blue as you can see. It turned out blue-ish dark chocolate brown. The blue part in the middle was spot dyeing damage control! The two-color sample made a nice book cover. There is a community on the island of Bali that specializes in double ikat and I hope that I can also spend some time with the weavers there. The other interesting thing about weft ikat is that the cloth must be balanced and I am always curious to know how backstrap weavers create balanced cloth on their looms. Do they use a reed? If so, I hope that I will be able to buy one for myself. I already have some bamboo reeds but would be very happy to acquire another of a different sett. On the other hand, if they don’t use a reed, I would love to learn how they manage to maintain an even sett without one. I am not sure how weft ikat will look in balanced cloth…quite sketchy, I should think…but I really want to learn how to plan and lay out a pattern and then place the weft in sheds for a minimum of blurring. I want to use what I learn to help me create some very simple double ikat one day. My last days in the USA were fun times spent with weaving friends. I got to see what some of them have been doing since my last visit.. Here are some of the pieces that my friends in Phoenix were working on using some of the finishing techniques that we had studied…tubular edgings, cross-knit looped edgings, braids and coil stitches. The pouch on the left has plain-weave tubular edging and coil stitches along the flap. The one on the right is edged with a patterned tubular band and has coil stitches along the bottom and cross-knit looped stitches along the top. The strap is a square braid. The pieces are sitting on a beautiful piece of Bedouin weaving that Nicole brought to show. One of my weaving teachers, Maxima, heads the co-op that produces these beautiful pieces of cloth. She is headed with fellow co-op member Justina and Dorinda to Peru this week to attend the Tinkuy in Cusco, the gathering of weavers of the Americas, that is run by Nilda Callañaupa’s Center for Traditional Textiles.. Maxima and Justina will give one of the presentations at the conference. With Dorinda’s help Max and Justina have put together a Power Point presentation…such a big step outside their comfort zone. I know Max as a very shy lady. I hope they get to present early on the first day so that they can put away their nerves and enjoy the rest of the conference. You can see Justina, at left, with the ch’uspa she wove to wear in the opening parade. Many of my weaving friends have gone to the Tinkuy including one of the ladies with whom I wove last August here in Australia. I can’t wait to hear how it goes. I opted to take the workshop in Bali instead and it is hard not being there in Peru this time. This young fellow was only 10 years old when I watched him weave at the first Tinkuy in 2010….7 years ago! I wonder where he is at with his weaving now at 17 years of age. I wonder if he will be there at this year’s Timkuy. Here is a piece of the cloth next to some hair braids that Janet made using a crossed-warp technique. The yarn is her own handspun. We played with tubular bands and decorative stitching to finish and embellish pieces of weaving. We wove the ñawi awapa pattern into tubular bands and Catherine mistakenly wove one orange eye on top of another connecting the two into ”cat’s eyes”. Rather than unweave it, she decided to weave the whole band that way weaving pairs of eyes instead of single eyes as is the traditional pattern. I love it and have named the new pattern ”michi ñawi” because the word for cat in Quechua is michi (and cat can be a short form of the name Catherine) :-). 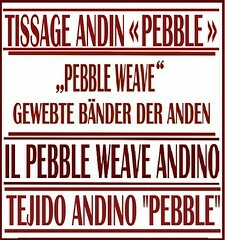 One of the Phoenix gatherings was all about double weave and we wove Andean Pebble Weave together in the other. The little llama figure was popular. We wove at Sarah’s place where she showed us a beautiful vest made from Shipibo painted cloth and handwoven panels that her husband had bought in his travels in Peru in the 70’s. What we couldn’t figure out was what the little wooden implements, which were acquired at the same time, could have been used for. Any ideas? We thought that they could be inked and then rolled to print a pattern. Hopefully the weaving provided a nice break from all the worry and concern over the fires that had ravaged the area. We couldn’t help but pass one of the affected areas on the way to Sonoma to shop one day…no words :-(. The air had cleared of the terrible smoke by the time I got to the area and we enjoyed a couple of days out at the barn weaving…. If you have been following my blog for some time, you will know Lily well. I have been watching her learning to weave at a backstrap loom with her mother’s instruction and then with some of mine since she was five. I got to accompany the family to Lily’s Feis (Irish dancing competition) in the bay area the following Sunday. She entered nine dance categories and won first place in eight of them…what a day! Lori had a new Huichol bag that she had bought to show me . The jaguar is brilliant in orange on the purple background. This is the Finnweave version of double weave pick-up in which certain shapes are slightly altered on the ”back” side of the cloth. While in Phoenix, my friends Annie MacHale (aka Aspinnerweaver) and husband Rick drove over from New Mexico to visit. We spent the day at the MIM, the Musical Instrument Museum in Phoenix. It’s awesome but probably needs three separate visits to take it all in. There was lots to inspire in terms of patterns on the musical instruments and folk costumes. The headsets we were given tuned in and out of each display as you moved around and allowed you to drift between exhibits at will, lingering at each one for as long as you chose. There were lots of people standing around tapping their toes to the various rhythms at each display. Because the decoration of musical instruments is often closely linked to a culture’s broader sense of aesthetics, it was sometimes possible to guess the origin of a piece from its ornamentation. It was fun trying to do that. The pattern on a gourd percussion instrument looked familiar and when I learned that it was from Panama, I remembered that I had seen similar Mola patterns. It was entertaining recognizing familiar textile patterns in many of the instruments and costumes. A Sami framed drum with beater, a goblet drum from Iran, a plucked lute from Saudi Arabia and a dancer’s dress with nanduti lace from Paraguay. I found the lowland Bolivian instruments, in the picture below, fascinating. I have yet to see or hear one of these bajunes being played n Santa Cruz. They belong to the unique Baroque-mestizo music that is part of the history of the Jesuit missions that were established in the second half of the seventeenth century in the jungle areas of Santa Cruz where I live. They are made from ”Kusi palm leaves, wood and leather”. While I have been to several of the Baroque music concerts in the city during The International Festival of American Renaissance and Baroque Music that is held in Santa Cruz every two years, I haven’t managed to see one of these being played. I need to get myself out to the jungle towns instead of racking up miles across the globe! They are a mere 90 km away from my home…a mere 2-hour drive in red dust…but that can turn into 14 hours if it rains! Meanwhile….my inbox and various online groups have shown me what some of my online backstrap weaving friends have been up to… Carlos Vargas in France wove a belt using the intermesh technique that I teach in my second book. This structure produces a really sturdy band and allows faces with two different solid colors. Carlos could have woven red motifs on a blue background and vice versa using this technique, if he had wanted to. Bob Seymour in the USA sent me this picture of various structures he has been studying using tutorials on this blog as well as in my books. Christine in South Africa wove another project on her inkle loom using my new book on Complementary-warp Pick-up. She used the 4-thread patterns as attractive borders for the 8-thread hook motif and made a belt. Julie wove this 18-thread pattern on her Gilmore MiniWave loom using a pattern and instructions in my latest book as well as this lovely wide piece with two columns of a 9-thread pattern. By flipping the pattern, as she has, you can create nice ”ram’s horns”. KatyCat on Ravelry wove one of the 6-thread patterns. I can see that she is using some of my friend Terri’s lovely swords from her MagicalMoons etsy store. Contact Terri if you would like swords made in any size you like. 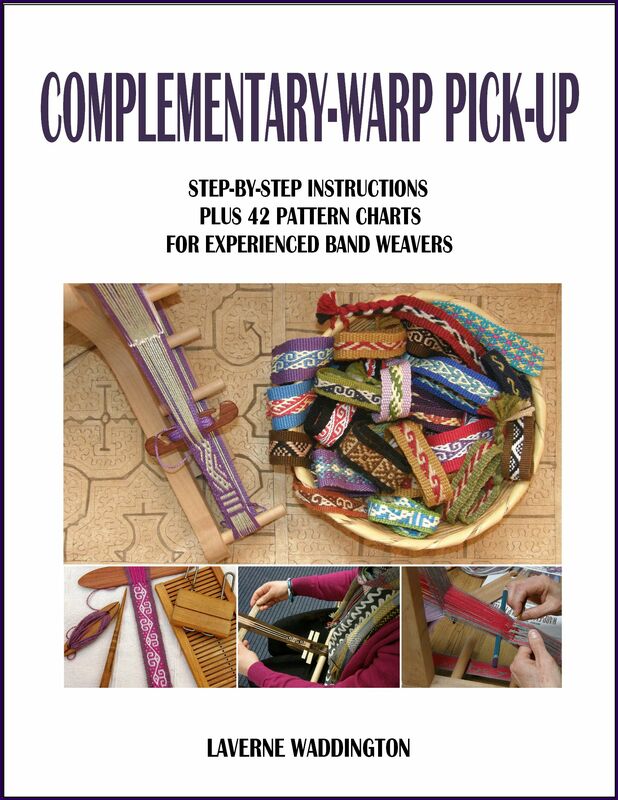 Wendy in Australia has been weaving some patterns from my second book. Here we see her set-up which involves attaching her warp to her floor loom. That’s a nice sturdy anchor for a backstrap warp. I hit the ground running when I got to Australia last week…no sign of jet lag! We were out and about the next day at the Sculptures by the Sea exhibit at Sydney’s beautiful Bondi Beach. There is lots to show you about that but I will leave you with just a couple of pictures. This first one is of a sculpture that took my fancy simply because the large wooden Y shapes made me think of backstrap looms and the forked tankas that are used in some warps in Peru to hold the cross. Seems I always have backstrap looms and weaving on my mind! I also found some time to put together a little slide show promotion for my new book on Complementary-warp Pick-up. I want to thank everyone who has bought it so far and tell you that I so appreciate all the feedback I have been receiving, especially the feedback that comes in the form of pictures of bands on looms! If you have already bought the book you might enjoy this little slide show anyway for the zippy music I chose. Plus, it might remind you that the file is on your desktop and nudge you in the direction of your loom :-)! Thanks, everyone! Sending hugs to all my friends who are at Tinkuy 2017. It’s weird being on this side of the world while you are all over there! 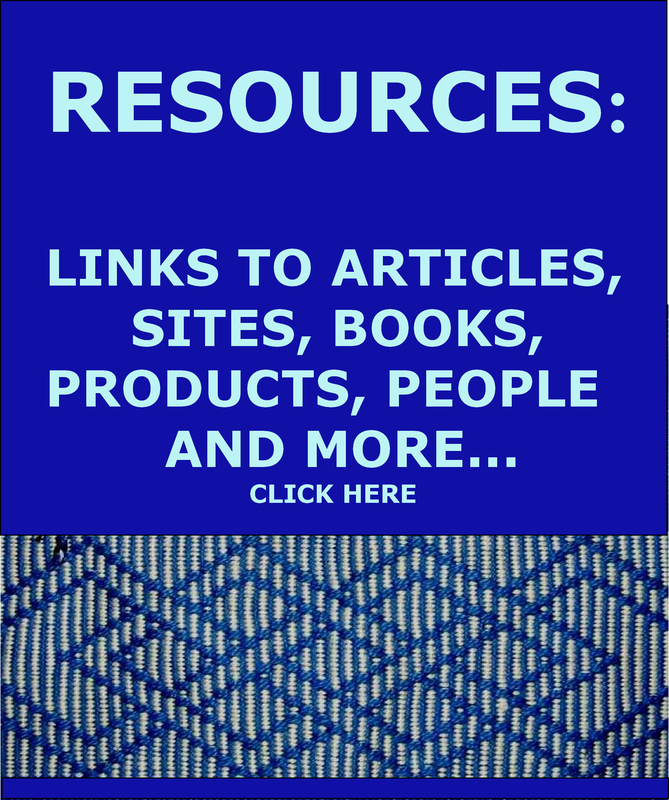 « Backstrap Weaving – What in the world? Where in the world? Too bad I didn’t know about your trip to Australia, Sofia. I could have pointed you toward weaving groups in Sydney, Melbourne and Tasmania. In any case, I am sure your time was filled with many other activities. Hi Laverne – we visited a small village in Bali that specialized in double ikat back in the late 80’s or early 90’s. Someplace I have a small booklet about the village. I think the village was called Tenganan or something like that. I’ll look for the book and copy it for you if I find it. Also about the Shipibo sticks – In 1980 when I traveled to Peru with my anthropologist friend, we visited a village up the Amazon and out the rio Napo. She had lived there on her previous visit. They weren’t Shipibo – they were Boras. And I don’t know how different the 2 tribes are, but in their community long house they had several huge drums made from hollowed logs that were used to call people to meetings. It’s hard to tell from your photos but they might be drum sticks. The ones at the Bora village were longer but had a carved head like those. Hi Virginia. Yes, Tenganan is the place I was told to visit for the double ikat! Glad you can confirm that it is the right place to go. I should have put something in the picture for scale. Those sticks are really quite small…maybe not even as long as a pencil. Sure wish we could catch up on one of my visits. I definitely would like to spend more time with you. Will you be attending Convergence next July? If so – you could come early or stay after and spend some time with us – sitting on our deck and enjoying the Tahoe summer. And relaxing. 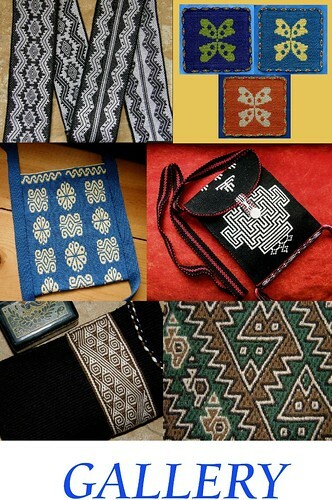 About Tenganan – I didn’t see anybody actually weaving but the few samples of double ikat that I saw weren’t as impressive as others I’ve seen since. They were just sort of messy – looked a little like an ink blot test. But I knew next to nada about ikat at that point. So with your back ground – I’m sure you’ll be better able to evaluate the textiles. Regarding “the little wooden implements,” I wonder if they could be drop spindles for spinning thread or yarn? The long one has that area at bottom of the long shaft that looks like some drop spindles have.